Nearby male grasshoppers try to outdo each other with singing. The song of the male is a one and a half-second long, loud metallic sound. Grasshopper species are quite complicated to distinguish from each other. Their body colour is very changeable and doesn’t help much in identification. It is not easy either to study the chirping creature in the grass: you bend down to study it but a push with its strong hind legs takes your observed object away into an undefined distance ... The activity requires patience. In comparison grasshoppers are by and large smaller than crickets. The feelers are only half the body length. Eyes are large and the hearing organs (tympani) are on the sides of the first abdominal segment. The chirping of grasshoppers can already be heard and the producers of the noise are the males attracting the females. The sound is created by rubbing the inside of the thighs of the strong hind legs against the edge of the wing sheaths. 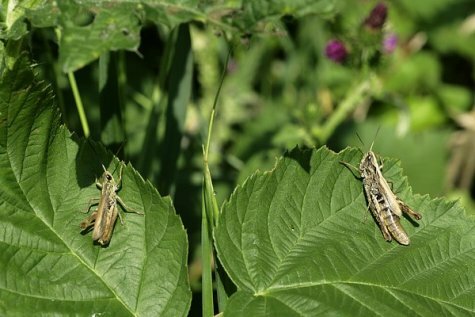 There are 22 kinds of grasshoppers in Estonia and all are herbivores.